These last few weeks have been exhausting for me. I feel like I can barely get in front of everything that I have/want to do. Sad thing is...I LOVE October...I love the fall and I love Halloween...and I've just been too stressed to really enjoy the fact that this is one of my favorite months. I know that the month is a little more than half way over but I am going to enjoy the cooler weather, eat tons of candy, and plan my Halloween costume! The other day one of my kiddos came into the classroom and saw his morning work waiting for him. He sat down and said, "Ms. Corbett, why do you give us the same...WAIT! It's different! It's HARDER!" He started in on his work and realized it wasn't as hard as he thought. Because the morning work increases in difficulty throughout the month, he knew what the he was supposed to do and the best way to complete the work. Soon he was singing the Alphabet song to remind him of the letter that followed after H. He went to our classroom calendar to figure out what day of the week it was. He was problem solving and my heart soared! This is not some advertisement for my Morning Work packet...it's just...I LOVE those moments in teaching. When they don't need you as much...when they recognize a challenge and rise up to meet it. LOVE IT! To top it off...I've been receiving messages of gratitude from other teachers who have purchased the Morning Work packet...they are so pleased with it and their students seem to like it as well. That makes my heart happy. The idea that other children are benefiting from something I've worked on ...kiddos I'll never meet...happy heart! All that being said I just wanted to say another HUGE thank you! Thank you to anyone who follows this blog. Thank you to anyone who downloads my work. Thank you to anyone who purchases items from my TpT store. Thank you! Thank you! Thank you! 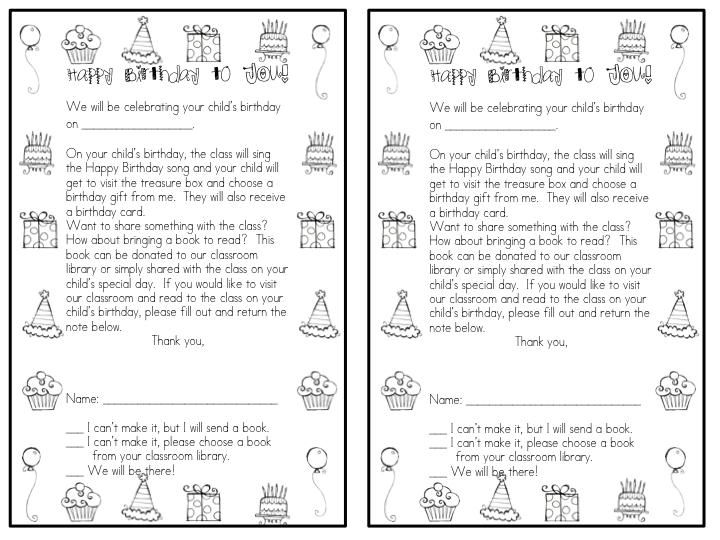 We are not allowed to celebrate birthdays with any kind of sugary treat in our classrooms...(sad, because I love me a good cupcake). So I found this awesome "bring a book to school instead" form to send home to parents. Now, I cannot remember or site the website where I got this from...so if you happen to know the original source please let me know. I altered the wording a little and added some clipart. It's free here for you. I hope you can use it in your classroom. I found you on a blog-hop and am happy to be your newest follower! Hoping you are safe and sound in Bedford. Love that bday note! Thanks!